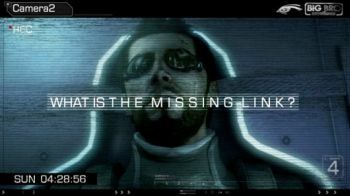 The Missing Link DLC will see Adam Jensen trying to escape a conspiracy-laden sea freighter without the help of his augmentations. Following its Human Revolution ARG escapade, Eidos Montreal has announced the development of the game's first DLC package. Missing Link will see lead character Adam Jensen drop off the grid for three days as he attempts to escape a Belltower-owned freighter (or, as rumor has it, an evil prison-boat). His usual augmentations will all have been disabled, forcing him to think his way to freedom. The story will be tied directly to Human Revolution's plot, with Eidos Montreal producer David Anfossi adding that it will "allow fans to be able to complete Adam's journey in the game." He will apparently uncover "another layer to the conspiracy that he never would have expected," continued Anfossi. Crucially, all of Adam's augmentations will be disabled. Anfossi said that this will allow players to see a more "vulnerable" side of the lead character while challenging them to adopt new styles of play. But before you start thinking that your teeth will be your only weapons, Anfossi added that "mysterious new allies" will be present to help Adam on his journey through the ship. Speculation surrounding this DLC announcement has been circling the internet for days, following on from the successful conclusion of Eidos Montreal's Human Revolution ARG and the details released about how much of the original game the developers had to cut out. Conspiracy-fueled fans and commentators managed to predict the DLC and its prison-boat component, but I don't think anyone saw an augmentation-free Adam coming. Who are these "mysterious new allies," I wonder? Eidos Montreal have yet to announce a release date or give any indiction of the price tag for Missing Link.